The “Exploitation of the Dead“ Collection by the self-educated neo-avantgarde artist Mladen Stilinović was compiled in socialist Croatia in the period from 1984 to 1990. It is a cycle of paintings dealing with the theme of dispersal or disappearance of symbols, both those widely accepted, such as the Christian cross, as well as the symbols of the Yugoslav socialist period, such as the red star. The author detects changes that affected the socialist system at the symbolic level in the 1980s and puts them in the context of art in a subversive way by using ideological and political reality. The "Exploitation of the Dead" Collection by Mladen Stilinović was compiled in the period from 1984 to 1990. The Collection holds several hundred small-format works that function as a single unit, but also as a cycle. Works from the Collection are kept around the world, both in public institutions and private collections. The Museum of Contemporary Art in Zagreb is one of the institutions that holds some of the works from the "Exploitation of the Dead" series, part of which is also included in the permanent exhibition of the Museum. Works have been coming to the Museum since the late 1980s. The first presentation of works from the "Exploitation of the Dead" series was in the Extended Media Gallery in Zagreb in 1988. 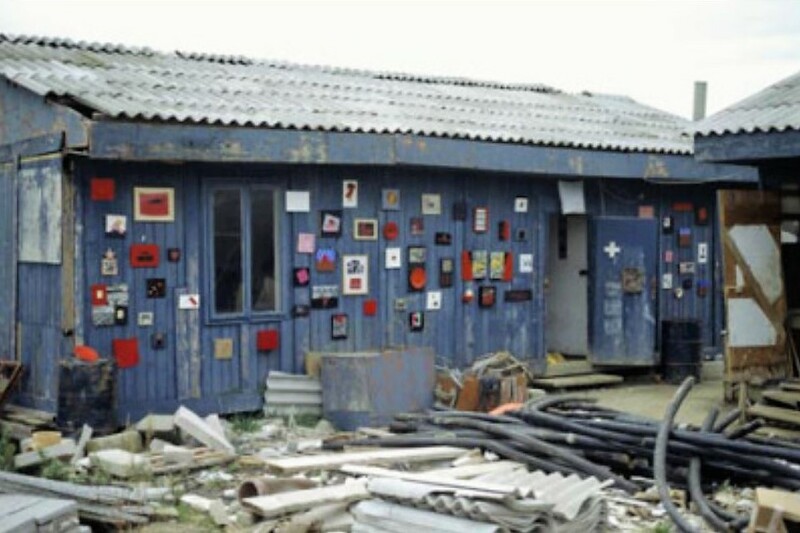 Stilinović selected a worker’s shed as a venue to present his works. As Stilinović himself said, the reason has two sides. On the one hand, in the socialist era an attempt was made to bring art closer to workers, “so by placing the works inside the shed, that is, in their daily surroundings, this is done directly. On the other hand, it was also an important idea to put all this together inside the exhibition space. Both of these are false or marginal situations in which I have always had an interest" (Marko Golub. "Mladen Stilinović (interview)˝. Dnevni kulturni info, July 12, 2007). 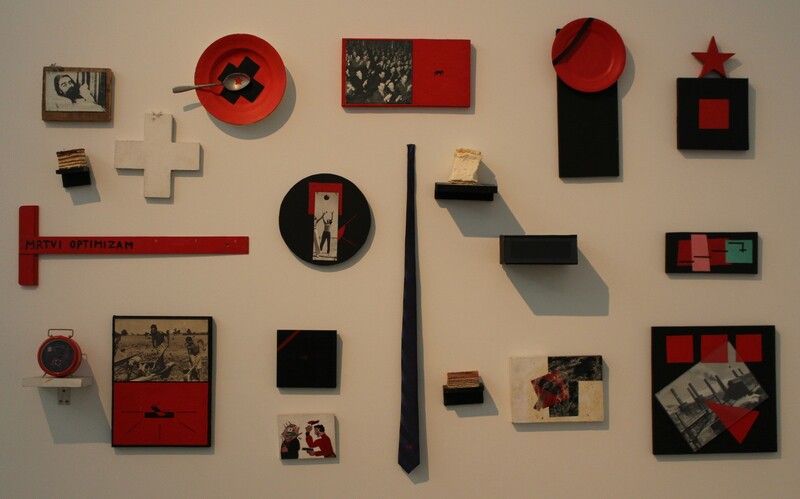 The Collection, that is, the “Exploitation of the Dead" series, was compiled in the last decade of socialist Yugoslavia’s existence, inspired by the author's perception of dispersal or, in some way, disappearance of the symbols of socialist Yugoslavia and socialist self-management. But at the same time, he problematized the symbols of Christianity, capitalism and neoliberalism. In the artistic sense, the "Exploitation of the Dead" is concerned with the exploitation of the dead poetics of the Russian avant-garde (Suprematism), Socialist Realism and post-war geometric abstraction. On the other hand, the "Exploitation of the Dead" cycle is also a critical commentary on the “return to painting.“. At this time, Stilinović was mostly irritated by various discussions - "on the one hand about quotations, and on the other about originality." Therefore, he introduced the term "exploitation" because, as he puts it, "this is certainly about exploiting history and certain movements in the history of art, and in an insolent way. I approached it this way, while others have avoided defining their art with the term of exploitation of specific poetics" (Marko Golub. "Mladen Stilinović (interview)˝. Dnevni kulturni info, July 12, 2007). The complete cycle of the "Exploitation of the Dead" contains about 400 small-format works, while the "Exploitation of the Dead" Collection in the Museum of Contemporary Art consists of 16 works. There is also a digital version of some items in the collection on Stilinović's personal website (www.mladenstilinovic.com). Those works are important as a source for the culture of dissent, because in them Stilinović critically presented the symbols of socialism and socialist self-management as worn out and out-dated, and hence the idea of socialism as a failure. Exhibition: Exploitation of the Dead, 1988. Event (general): Opening of the permanent display of the Museum of Contemporary Art, 2009. Exhibition: Zero for Conduct, Retrospect, 2012-2013. Stipančić, Branka and Tihomir Milovac. Mladen Stilinović: Exploitation of the Dead. Zagreb: Muzej suvremene umjetnosti, 2007. Beroš, Nada. Akcenti - Vodič kroz Zbirke u pokretu. Zagreb: Muzej suvremene umjetnosti, 2009. Golub, Marko. "Mladen Stilinović (interview)." Dnevni kulturni info, July 12, 2007. http://www.dnevnikulturni.info/intervjui/likovnost/1360/mladen_stilinovic/. Kipke, Željko. "Estetika gustog postavljanja slika: Mladen Stilinović: Eksploatacija mrtvih 1984-1988." Život umjetnosti 45/46 (1989), 81. Nikitović, Spomenka. Mladen Stilinović. Zagreb: Meandar, 1998. Stipančić, Branka. Mladen Stilinović: Nula iz vladanja = Zero for conduct, Zagreb: Muzej suvremene umjetnosti, 2013. Šimičić, Darko. "Razgovor s Mladenom Stilinovićem." Život umjetnosti 45/46 (1989), 80-81.